The Flame against Fujin; Dangerous temptations. While running to school, Recca recalled the events that had happened last night, mainly about his newfound ability to create fire. He vowed to himself that he would protect his Hime, Yanagi no matter what happen in the future. 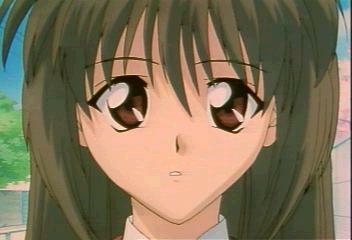 Yanagi was walking towards the school gate when she heard Recca calling her. She turned around and gasped at the sight of him using the heads of the students as his stepping-stones. In the midst of doing so, Recca stepped on his ‘old friend’, Domon who yelled at him in annoyance. Recca tripped and fell; Domon laughed at him but also fell down as well. Recca suddenly popped in front of Yanagi, knelt down and said ‘Your ninja, Recca Hanabishi, awaits you. Hime.’ At that point, everybody stop at whatever he or she was doing and stared at the couple. The words, ‘Your ninja’ echoed throughout the entire school. Yanagi, uncomfortable with the tense attention, ran off with Recca closely behind her. The news was out – Yanagi Sakoshita had defeated Recca Hanabishi! During break time, Yanagi and Recca were having their meal under a tree. Yanagi told Recca not to call her ‘Hime’ due to the looks that she had been receiving the whole day. During their talk, Domon showed up and threw Recca into a bin. Still disbelieving that Recca had allowed himself to be defeated by a girl, Domon demanded an explanation. Recca simply refused because he believed that he didn't have to give his reasons to a ring-nosed pig. Domon (angered by the words, 'ring-nosed pig') ran forward to attack him, stopped and then started to scream as he jumped up and down over the ninja stars that he had unknowingly stepped on. Recca gave a war dance and was about to walk away when Domon yelled out that Fuko would not forgive Recca for doing this. A gush of wind swept past Recca who stood still for a moment. Then, he carried Yanagi and ran all the way to the school rooftop. 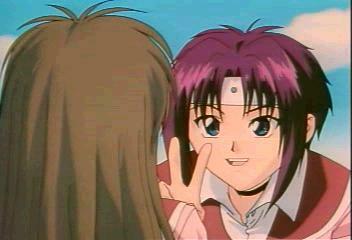 Recca explained that Fuko Kirisawa had been his rival since childhood and they were in a pretty mess. Suddenly, a dart came out from nowhere, nearly hitting Recca who cursed in response. Sitting on top of the fence was no other than Fuko Kirisawa who gave a saucy greeting. Recca yelled at her for nearly causing an accident but Fuko walked past him and towards Yanagi. Without reason, she slapped Yanagi across the face and was surprised that Yanagi didn’t react at all. Fuko (after absorbing this new knowledge about Yanagi) couldn’t believe that Recca actually allowed himself to serve a girl like Yanagi who couldn’t even defend herself. She recalled her past fights with Recca for the last 10 years and the taunting words – If you defeat me, I’ll be your personal ninja.’ Fuko then decided to attack Yanagi because if she defeated her that means that she had defeated Recca. She lunched forward; Recca blocked her but gets kicked. Fuko warned Recca to get out of the way but unknowingly got caught in a net. She screamed as she tries to get out of it. Recca then told Fuko his reason for his action. He became Yanagi’s ninja simply because he wanted to. Unknowingly to the trio, Kage Houshi was watching them. Late at night, Recca received a call from Fuko. He told her to go to bed but got a shock when he heard Kage Houshi’s voice. Kage Houshi told him that they would be waiting for him at school. Recca ran out of his house and rushed off. While he was running, he ran past Yanagi who happened to eating something at a shop. At school, Recca saw Fuko who eagerly attacks him on the spot. Kage Houshi made her presence as well. She told Recca that an amateur like Fuko, was possessed by Fujin, which would make her to have the desire to kill. Fuko attacked Recca, who was trying his best not to hurt her. He was hit and crashed into a gate. Yanagi (just arriving at the scene) seeing her Recca in great trouble, ran off to find help. Kage Houshi followed her and knocked her unconscious because she wanted no interference in Recca’s training. When Yanagi opened her eyes weakly, she saw a huge figure standing before her. Back to the school, Fuko continued her assault on Recca until it came to a point where Recca was unable to dodge a deadly blow. However, Domon rescued him just in time. He told Recca that Yanagi iwas safe but unconscious. Fuko got really mad and attacked. Recca moves out of the way but Domon stood still and gets hit. The upset Fuko went on attacking, angered by Domon's interference. Domon continued to walk towards her, taking in every blow that Fuko gave. He fell on his knees and hold her, pleading her to stop. A tear from his eyes fell on the ore of Fujin, which dimmed, releasing its control on Fuko. Fuko becomes frightened and cried for help. Seeing this, Kage Houshi immediately increased Fujin’s power, which caused Fuko to lose control of herself and set off a powerful wind, knocking off Recca and Domon.. Kage Houshi taunted Recca for his inability to rescue her. Recca became furious at Kage Houshi for hurting Fuko, Domon and Yanagi. Fire emerged from his arm, stunning Fuko who quickly recovered and sets off a wind blade towards Recca.